Amazon Prime Day 2018: What You Must Know, All In One Place! Amazon Prime Day 2018: What You Must Know, All In One Place! Amazon Prime Day 2018: What You Must Know, All In One Place! Update: It’s official – Amazon Prime Day will take place on July 16th (Monday) and will run for 36 hours straight. This means that Amazon Prime Day 2018 will be the longest Prime shopping event – lasting for a day and a half. So, make sure you’re prepared and be here with us on July 16th as we’ll bring you a list of the best shopping deals on Amazon! The majority of Amazon Prime members are well-aware of the company’s Prime Day. You already know that we have a few unmissable shopping occasions every year, such as Black Friday which happens every autumn. Well, Amazon’s summertime craze is upon us, and we are going to tell you all you need to know about the upcoming Amazon Prime Day 2018. Therefore, let’s dive deep and see what we can expect this year. First things first, let’s take a moment to see what is Prime Day. Three years ago, Amazon created a special shopping occasion to celebrate 20 years of its existence. Many experts agreed that the e-commerce giant actually wanted to show its dominance online. The goal was to eclipse the biggest shopping day in the US, and that is Black Friday. And we have to say that Amazon is on the right track. During the last three years, this initiative grew and produced hundreds of highly attractive deals. In 2018, we expect Amazon Prime Day to be bigger than ever before. What is also worth knowing is that during Prime Day, new deals go live every five minutes. This means that you need to be quick if you find something interesting. So, don’t hesitate to buy something after a quick price comparison. Amazon Prime Day 2018: When Does it Happen? We already know that Amazon Prime Day 2018 starts on July 16. However, this year’s shopping event won’t only start earlier than ever. It will also last longer. Take a look at the table found below for a quick overview. Countries Included The US, UK, Spain, Mexico, Japan, India, Italy, Germany, France, China, Canada, Belgium, Austria, Australia, Singapore, Netherlands, Luxembourg. As you can see, this year’s Prime Day isn’t only bigger than ever, it’s also expanded to include new countries as well. Amazon Prime Day 2018: Deals Available Right Now! Twitch Prime – members will receive one free PC game through July 18. Some of the included games are Pillars of Eternity and Brutal Legend, as well as in-game loot for titles like Warframe and PlayerUnknown’s Battlegrounds. What’s New With Prime Day 2018? This will be the fourth year that Amazon is offering heavy discounts during its Prime Day. Even though this event is still young, it has greatly matured over the previous three years. For example, there was a problem with running out of inventory for many items back in 2015. Amazon didn’t expect that demand for many of its deal to be so high. It’s safe to say that this won’t happen this time around, even though we advise you to be as quick as possible. To say on top of the latest deals, you can use Amazon’s app on your smartphone and receive push notifications about the biggest deals. When it comes to new things, there are a few quite interesting surprises. First of all, Amazon is all in when it comes to marketing. Giant (and truly giant) Prime boxes will arrive in New York City, Los Angeles, London, Tokyo, and Milan. Each box will present an event that will take place in each of these cities. You can live-stream these events on a dedicated Unboxing Prime Day page. Moto G6 64GB – an exclusive version of the G6 Android smartphone. Finally, Amazon’s Whole Foods will also bring a bunch of surprises. You can expect 10 percent off hundreds of products, as well as deep discounts on hugely popular products. Also, Amazon Prime Rewards Visa cardmembers can double the rewards from July 15 through July 17 – and get 10% back on up to a total of $400 in purchases. Who Can Shop on Prime Day? As the name of this event implies, you need to be an Amazon Prime member to take advantage of this event. In case you’re not a member, now is the right time to reconsider your options. You can sign up for a 30-day free trial and test drive this service – which includes Prime Day 2018 as well. We’d also like to take a moment to let you know that Amazon has increased its Prime membership fee. Previously priced at $99 per year, you can join the program for $119 per year now. This doesn’t only get you discounts on all kinds of items. Instead, you can also use Amazon Video which has become a rival to Netflix. And there’s also Amazon Music, which is a powerful music streaming service – in addition to a huge library of free Kindle e-books. If you think about it for a minute, this membership can replace your Netflix and Spotify memberships, and help you save money in the long run. You can join Amazon Prime for $12.99 per month, or $119 per year. To see what you can expect, learn more about Amazon Prime. What Kinds of Deals to Expect on Prime Day 2018? Without any doubt, we expect Amazon-made devices to lead the entire Prime Day. This especially goes for Amazon Echo Dot smart speakers. Then, we have Kindles and Fire devices, which all work great if you have an Amazon Prime subscription. Thanks to Kindles, you can read e-books on the go while Fire streaming devices will let you take advantage of Amazon Video. Just a few days ago, Amazon unveiled an all-new device named Fire TV Cube, priced at $119.99. Even though we don’t expect to see a massive discount here, it might be wise to wait a few more weeks and grab a better deal. Especially because this is the most expensive Fire streamer at the moment. Next, you should know that gaming consoles were quite popular during last year’s Prime Day. Aside from the new Nintendo Switch that is bound to get some sweet deals, the same could be said for PS4 Pro and Xbox One X. These consoles won’t just be offered at a better price, they will most probably offer bundles. Finally, we expect the entire tech section of Amazon to be filled with amazing deals, ranging from 4K TVs, headphones, sound systems, up to home appliances. In case there’s something you want to buy; your patience might pay off big in a little while. How Do Amazon’s Rivals Respond to Prime Day? This won’t be the first Amazon Prime Day – and we’re sure that Amazon’s rivals have prepared amazing deals as well. Last year, Google offered a special discount on its range of smart speakers. The same happened with eBay, Walmart, and Newegg. As a report from Bazaarvoice indicated, 76% of Prime Day shoppers also visited rival websites to check for attractive offers. In case you’ve wanted to buy one of Google’s top-rated speakers, or if you’re on the market for a new computer, it’s worth waiting a bit more if you want to get the best possible deal. This doesn’t only apply to the US favorites, but also to e-commerce giants from the UK. How to Know if Prime Day Deals Are Any Good? The truth is that Prime Day deals don’t last for a long time, and many of them will end once all items are sold. This means that you need to be quick to react and make sure your payment is processed as soon as possible. As you know, this also raises a lot of questions. One of the most important ones is how to know if you’re getting a good deal? Retailers use all kinds of tricks to sell their products. So, make sure not to trust them blindly. If Amazon says that something is at its lower price, this doesn’t necessarily have to be true. Lucky for us, there are ways to keep track of prices. One of the most helpful tools is CamelCamelCamel, which offers Amazon price history charts and lets you identify the best deals easily. Also, you can do your own research but remember to be quick. Our previous experience showed us that you should never buy Amazon-made products at full prices. Every once in a while, which happens several times a year, Amazon is offering its products at unbelievable prices. You can buy the company’s Echo Dot for $40 (usually priced at $50), or the Kindle Whitepaper for $100 (instead of $120). You just have to be patient on the lookout for amazing deals. The best thing is that this doesn’t require a lot of effort. Your Amazon app will let you know once something like this happens. Prime Day 2018: Should You Expect Any Problems? Without any doubt, Prime Day is a big event. Millions (or even dozens of millions) of shopper visit Amazon’s website and make at least one purchase. With this kind of traffic, all kinds of problems might happen. Still, as we noted earlier, we’re sure that Amazon will do its best to avoid any issues. First, you should always do your own research. Some products might offer deals that might look good – when they might be scams. For example, products might offer $1 discounts to be listed among Prime Day sales and tempt you to buy them. Also, shipping times might easily become longer. In case your Amazon prime delivery dates slip, you should complain to Amazon as soon as possible. As a Prime member, you are guaranteed to receive fast shipping. If that doesn’t happen, Amazon might offer something in return like a free month of Prime. So, know your rights – and don’t be afraid to speak your mind. 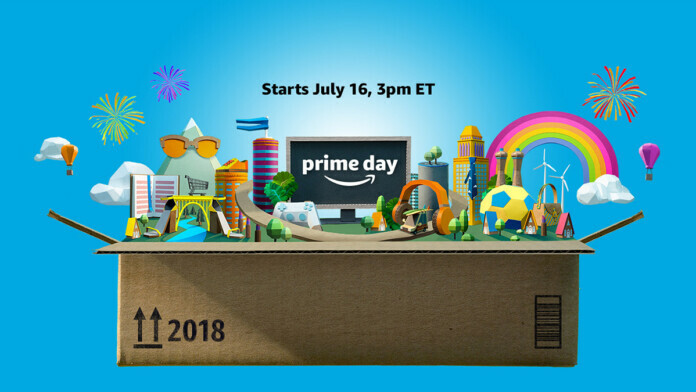 Dear TechNadu visitors and readers, that would be all you need to know about Amazon Prime Day 2018. Make sure to bookmark our website as we’ll keep bringing the last news as they come. Also, make sure to visit us on Prime Day as we’ll bring the hottest deals you’ll find on Amazon. In case you think this article might help other shoppers, why not share it online? Thank you!